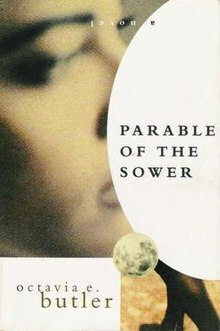 Parable of the Sower is a science fiction novel by American writer Octavia E. Butler, the first in a two-book series. It was published in 1993. Set in the 2020s where society has largely collapsed due to climate change, growing wealth inequality, and corporate greed, Parable of the Sower centers on a young woman named Lauren Oya Olamina who possesses what Butler dubbed hyperempathy or "sharing" – the ability to feel pain and other sensations she witnesses. As a teenager growing up in the remnants of a gated community near Los Angeles, she begins to develop a new belief system, which she comes to call Earthseed. When the community's security is compromised, her home is destroyed and her family is murdered, and she travels north with other survivors. Society outside the community walls has reverted to chaos due to resource scarcity and poverty, and mixed race relationships are stigmatized amid attacks against religious and ethnic minorities. Lauren believes that humankind's destiny is to travel beyond Earth and live on other planets, forcing humankind into its adulthood, and that Earthseed is preparation for this destiny. She gathers followers along her journey north and founds the first Earthseed community, Acorn, in Northern California. Butler had planned to write a third Parable novel, tentatively titled Parable of the Trickster, which would have focused on the community's struggle to survive on a new planet. She began this novel after finishing Parable of the Talents, and mentioned her work on it in a number of interviews, but at some point encountered writer's block. She eventually shifted her creative attention, resulting in Fledgling, her final novel. The various false starts for the novel can now be found among Butler's papers at the Huntington Library, as described in an article at the Los Angeles Review of Books. Published by Four Walls Eight Windows in 1993, by Women's Press Ltd. in 1995, by Warner in 1995 and 2000, and by Seven Stories Press in 2017. Parable of the Sower was adapted as Parable of the Sower: The Concert Version, a work-in-progress opera written by American folk/blues musician Toshi Reagon in collaboration with her mother, singer and composer Bernice Johnson Reagon. The adaptation's libretto and musical score combine African-American spirituals, soul, rock and roll, and folk music into rounds to be performed by singers sitting in a circle. It was performed as part of The Public Theater's Under the Radar Festival in New York City in 2015 and in 2018. Parable of the Sower was referred to in hip-hop artist Talib Kweli's song "Ms. Hill" off his mixtape Right About Now: The Official Sucka Free Mix CD. In the song, which is about Lauryn Hill, Kweli references how Lauryn Hill used to come into Nkiru (a bookstore Kweli owns in Brooklyn, New York) and liked to buy Octavia Butler books, namely Parable of the Sower. "We used to chill at Nkiru / her moms was a customer / she used to love to buy the books by Octavia Butler / Parable of the Sower, the main character's name was Lauren". In Lauren Beukes' 2013 novel The Shining Girls, the body of one of the victims, Jin-Sook Au, a social worker, is found with a copy of Parable of the Sower. Part of the central verse of Earthseed, "All that you touch you change, all that you change changes you", is included in track 2 and 6 of Sugar Candy Mountain's album 666. The work of hip hop/R&B duo THEESatisfaction was influenced by Octavia Butler. The third track from their 2012 album awE NaturalE, "Earthseed", contains themes from the Parable series: "Change there are few words / That you can say / We all watch things morphing everyday." In season two of the Netflix series The OA (themes of inter-dimensional travel and NDEs), Parable of the Sower is recommended by a book seller. Agusti, Clara Escoda. "The Relationship between Community and Subjectivity in Octavia E. Butler's Parable of the Sower.' Extrapolation 46.3 (Fall 2005): 351–359. Allen, Marlene D. "Octavia Butler's 'Parable' Novels and the 'Boomerang' of African American History." Callaloo 32. 4 2009 pp. 1353–1365. JSTOR 27743153. Andréolle, Donna Spalding. "Utopias of Old, Solutions for the New Millennium: A Comparative Study of Christian Fundamentalism in M. K. Wren's A Gift upon the Shore and Octavia Butler's Parable of the Sower." Utopian Studies 12.2 (2001): 114–123. JSTOR 20718319. Dubey, M. "Folk and Urban Communities in African-American Women's Fiction: Octavia Butler's Parable of the Sower." Studies in American Fiction 27. 1 1999 pp. 103–128. Govan, Sandra. "The Parable of the Sower as Rendered by Octavia Butler: Lessons for Our Changing Times." FEMSPEC 4.2 (2004): 239–258. Hampton, Gregory J. "Migration and Capital of the Body: Octavia Butler's Parable of the Sower.” CLA Journal 49 (Sept. 2005): 56–73. Jos, Philip H. "Fear and the Spiritual Realism of Octavia Butler's Earthseed." Utopian Studies 23. 2 2012 pp. 408–429. JSTOR 10.5325/utopianstudies.23.2.0408. Lacey, Lauren. J. "Octavia Butler on Coping with Power in Parable of the Sower, Parable of the Talents, and Fledgling." Critique 49.4 (Summer 2008): 379–394. Melzer, Patricia. "'All That You Touch You Change': Utopian Desire and the Concept of Change in Octavia Butler's Parable of the Sower and Parable of the Talents." Contemporary Literary Criticism Select. Gale, 2008. Originally published in FEMSPEC 3.2 (2002): 31–52. Nilges, Mathias. "'We Need the Stars': Change, Community, and the Absent Father in Octavia Butler's 'Parable of the Sower' and 'Parable of the Talents.'" Callaloo 32.4 2009 pp. 1332–1352. JSTOR 27743152. Phillips, Jerry. "The Institution of the Future: Utopia and Catastrophe in Octavia Butler's Parable of the Sower." Novel: A Forum on Fiction 35.2/3 Contemporary African American Fiction and the Politics of Postmodernism (Spring – Summer, 2002), pp. 299–311. JSTOR 1346188. Stillman, Peter G. "Dystopian Critiques, Utopian Possibilities, and Human Purposes in Octavia Butler's Parables." Utopian Studies 14.1 (2003): 15–35. JSTOR 20718544. Texter, Douglas W. "Of Gifted Children and Gated Communities: Paul Theroux's O-Zone and Octavia Butler's The Parable of the Sower." Utopian Studies 19. 3 2008 pp. 457–484. JSTOR 20719921. ^ Fox, Margalit (March 1, 2006). "Octavia E. Butler, Science Fiction Writer, Dies at 58". The New York Times. ^ a b c Holden, Rebecca J.; Shawl, Nisi, eds. (2013). "Annotated Butler Bibliography". Strange Matings: Science Fiction, Feminism, African American Voices, and Octavia E. Butler. Seattle, WA: Aqueduct Press. p. 282. ^ Canavan, Gerry (June 9, 2014). ""There's Nothing New / Under The Sun, / But There Are New Suns": Recovering Octavia E. Butler's Lost Parables". Los Angeles Review of Books. Retrieved May 19, 2016. ^ Moon, Grace. "Toshi Reagon's Parable." Velvetpark: Art, Thought and Culture. 14 January 2015. ^ "Under the Radar 2015 Octavia E. Butler's Parable of the Sower: The Concert Version" The New York Times. 18 January 2015. ^ "BK Live 1/14/15: Toshi Reagon." Brooklyn Independent Media. 16 January 2015. ^ Goodwin, Jeremy D. (1 January 2018). "A Prescient Sci-Fi 'Parable' Gets Set to Music". New York Times. Retrieved 18 April 2018.